I just read an article that made me wince, not because it was bad, but because it so eloquently explained ideas I've wanted to write about for years. The article was "Dangers oftraveling while female" by Tara Isabella Burton on Salon.com and yes, the title is terrible. Burton doesn't talk about the dangers women encounter in foreign countries; instead she expertly shows how female travel writers and adventurers have to give up many possibly amazing opportunities in order to avoid becoming sexual targets. But the kicker is the last half where the article winds into what I wish I could shout at the entire travel world: women's travel experiences might not be the same as men's but we see another angle of the world, the female angle, that makes up about 50% of the complexity of the human experience. So what does this have to do with taking rides from strangers? 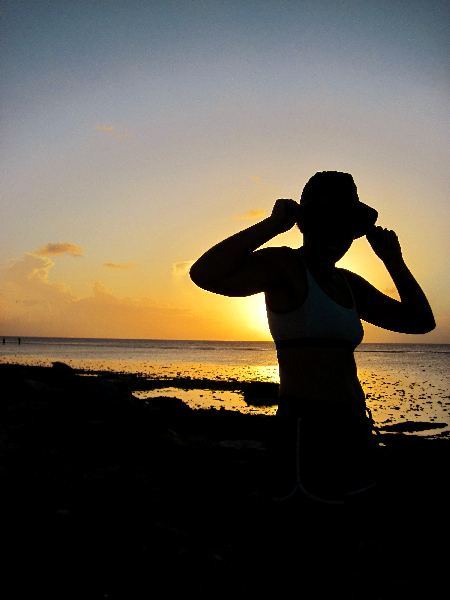 My first solo travel adventure was to French Polynesia when I was 19 years old. Like Burton I imagined myself as the classic Indian Jones-type character, chugging off into the sunset on supply ships, swimming with sharks and living off of raw fish. Actually I did all these things but along the way I made one terrible mistake: I forgot that I was a woman. Because of this, the scariest experience I've ever had when traveling happened on this first trip. I still often forget that I'm a woman and then, before I do anything too stupid, I remember this story. On a cloudless, perfectly tropical day I was waiting for Le Truck (the local bus) from my Tahitian hostel into the capital of Papeete. I'd been waiting maybe 10 minutes, enjoying the cackle of voices from a nearby fruit market and the smell of burning leaf piles in the air, when beat up Pugeot with a bunch of windsurf boards tied to the roof puttered up next to me. A smiling, slim but strong Polynesian face asked me if I wanted a ride. I recognized the guy as the sun-weathered windsurfing instructor of my hostel. "Je t'ai vu sur la plage," he said [he'd seen me on the beach], after his offer for a lift. My 19 year old self didn't see this statement beyond that I had in fact been on the beach and it was normal that he would have seen me there and thus recognized me at the bus stop. In my head I was a swashbuckling voyager, not a bikini babe so instead of seeing this guy as a person who may have been hitting on me, I imagined it as a possibility for an authentic connection with a local. I can't remember what his name was so let's call him Teva. Teva spoke no English and at the time I spoke minimal French. We clacked along in his low-to-the-ground car past giant mango trees, small waves crashing against the black lava shoreline and plump women in colorful pareu herding children along the slim shoulder of the road. Teva chatted with me the whole time, even though I only understood about 20 percent of what he was saying, and often took his gaze away from the road to try and look me deeply in the eyes. By the time we reached the traffic-filled market area of Papeete I wasn't sure, but it seemed like he had invited me to go to Moorea with him and I had agreed. I had no intention of going to Moorea with Teva however since, after all the leers and what seemed to be flattering comments about my appearance, my instincts told me that Teva was not going to provide the type of authentic local experience I was hoping for. Still, when Teva suggested that we both run our errands then he'd drive us both back to the hostel, I agreed. Our meeting place post-errands was a busy French bakery with outdoor cafe-style tables and chairs set up in the main walking area of a small indoor mall. When I got there Teva had already bought me a plate of fancy pastries and ordered me to eat them. I like pastries but his aggressive tone put me on edge. I ate one and pushed the rest aside. He knitted his eyebrows together, gave me a look like I had just broken his favorite toy and brusquely said we had to go. This was fine with me, I was ready to be back at the hostel and rid of Teva. When we got in the car parked along a dirty curb, he had several wrapped gifts waiting for me and told me to open them. Especially after the weird bakery scene I had not expected presents so this caught me off-guard. I opened them - one contained two cheap tourist T-shirts and the second was a Tahitian pareu and a book on how to tie it. I thanked Teva for the gifts but he was obviously still angry about the pastries and would hardly look at me. Off we went, taking a freeway that led over a small hill with a beyond-my-dreams view of the geometric silhouette of Moorea, which I had never seen before. It was then I realized we were going the wrong direction. "Where are we going?" I asked, trying not to sound too alarmed. "To the most beautiful place on the island," he said in French. Suddenly he was no longer angry, his voice was soft, nearly patronizing. The most beautiful place on Tahiti for Teva was the Maeva Beach Resort just outside Papeete. It was a block-style waterfront resort on a small white sand beach with that same outrageous view of Moorea. Why at this point I didn't bolt out of the car as soon as we parked I have no idea. I think I needed things to get really bad to learn this lesson. And so, we went in to the hotel and out to the beachside bar on a patio a few feet from the fine white beach. Caucasian tourists, mostly aged 40 and up looked at me with that surprised look of disdain that's only given to a white woman who looks like she's bonking a non-white male. I would experience this a number of times later in life but this was my first experience with an icky racism that prevails in all cultures and skin colors around the world; it made me feel dirty. Teva ordered himself and me a beer without asking what I wanted. Beads of condensation dribbled down the sides of the glass, reflecting the glare of the sun off the sand. I immediately told him I wasn't going to drink a beer. At first Teva really looked like he was about to hit me but he took a breath, then sat sulking, taking long sips of his beer. "It's expensive here," he said. "You're wasting my money." After maybe 20 very uncomfortable minutes Teva had finished his beer. Mine sat warm and flat, no longer attracting luscious tropical flashes of sunshine. We got up and walked towards the hotel. Teva's movements were fast and stiff and I had trouble trying to keep up with him. There was an elderly American couple in the elevator that took us up to the lobby floor that accessed the parking lot. I looked at them and thought that maybe I should tell them about my predicament, that I was scared of Teva and didn't want to get back in the car with him. I also didn't know how I would get back to the hostel at this point without him. A very stupid blend of politeness, shyness and the inability to raise a scene stopped me from saying anything and I continued, with Teva back to the car. This is where my memory gets blurry. I think we drove out of the parking lot and got on the freeway. Teva was proclaiming some sort of love for me before pulling over to the side of the road, grabbing me, cramming his face against mine and sticking his tongue down my throat. I wish at this point I had kneed him in the balls or gouged his eyes out but no. I did however manage to get loose, open the car door and escape, I don't remember how. Teva yelled some Tahitian explicatives at me and screeched away leaving me alone on the side of the freeway with two T-shrts, a pareu and a book about how to tie them (how I managed to end up with these I have no idea. Maybe Teva threw them out the window at me?). How was I going to get back to my hostel? Again, my memory here is blank but somehow, I got back. Later when I told the cranky, chain-smoking ex-pat American owner of the hostel what had happened she said in a loud cracking voice, "Oh Teva's OK, just don't sleep with him." Not surprisingly the hostel closed down a few years later after several women complained about being harassed. My biggest take away from this experience is that it could have been far worse. Teva was a scum but I was lucky that he was a soft scum who would warn me about the greater evils in the world. Now, not only do I never take rides from strangers but I would never agree to go to Moorea with someone to be polite or hang out with them a minute longer if they even suggested this. I wouldn't accept an inappropriate gift, I would insist on at least splitting the cost of pastries and I can firmly say "no" without feeling rude. The list goes on. But far worse is that, when say a guide offers to take me out alone at night and for free to watch sea turtles nest on remote Malaysian beaches, I turn him down. When I'm about to pass out of heat exhaustion in Thailand and a big van with two men inside offer me a ride, I choose heat exhaustion instead. This is the bad deal we have as women. The flip side is, as Burton writes, that I get to see into women's lives and experience a world that men will never see. Instead of seeking out authentic experiences with surf instructors, I try to befriend local women, hold their babies and maybe learn to cook a local specialty. The travel world has not caught on that these types of experiences offer adventures that can make for beautiful and exciting stories. Women's worlds are as interesting and rich as men's and yet we know so much less about them. In fact, this is a whole other story that's longer, greater and closer to my heart than I may ever be able to condense into a single blog post. This is what I want to write about, now and for the rest of my life. Yes, yes, Celeste! Beautifully written, and so true, especially: "Women's worlds are as interesting and rich as men's and yet we know so much less about them." Thanks Cinthia! The idea that women's lives are less interesting than men's is just another kind of burqa. Let's take it off. I recently came across your blog and was wondering if there were any sponsored post opportunities available? I represent a number of travel clients who are looking to sponsor posts with a contextual link in, either in the text itself or in a disclosure at the end. Let me know if that’s something you’d be interested in, or if you have any similar alternatives and we can discuss further and make arrangements. You can contact me on James.Dart@accordgroup.co.uk. Sorry James there are no sponsored post opportunities here. It's just me writing my own stuff, totally free of anything commercial. I usually don't publish these requests because most aren't as professional as this. Best of luck and thanks for asking. Also this is now meant to warn anyone else looking to do the same thing as James, not to bother. Now if I hear from you I can be sure you haven't read my blog. Thanks.